The new $99 “Backup Plus” from Seagate holds a terabyte of storage in a drive that can fit in a shirt pocket. It works with both Windows and Mac and you can go back and forth between them. It automatically backs up all your files and the photos and videos you share on Facebook and Flickr. The whole idea of a terabyte still stuns us. This is technology! A terabyte is a thousand gigabytes; a gigabyte is a thousand megabytes. A megabyte stores around 200,000 words. This column runs once a week and typically uses about a thousand words; so four years of columns would use up just a little more than a megabyte. It’s enough to make a poor electron gasp. 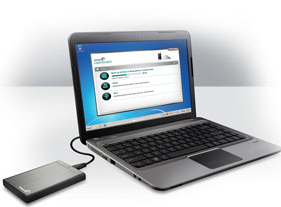 The drive uses USB 3.0 or 2.0 connections on a Windows machine or the speedy “Thunderbolt” and Firewire on a Mac. If you haven’t cottoned to the difference between USB 2.0, which has been around for several years now, and the new USB 3.0, it’s around three times faster; a 1.2 gigabyte file transferred in 15 seconds. A “Protect Now” button copies all the files of your Windows computer over to the drive. Another button let you download all your photos from Facebook This excited some reviewers, but not us, since a free program, “SocialFolders,” does the same thing. By the way: this drive did not work when we first plugged it into our computer. We got a message saying “This drive is corrupted. Would you like to reformat it?” The drive was indeed corrupted, but reformatting it made everything come out all right.